New 'Shadow of the Tomb Raider' trailer showcases Maya ruins, tropical jungles, and ritual sacrifices. On April 27, Square Enix, Eidos Montréal, and Crystal Dynamics gave Tomb Raider fans their first proper look at Shadow of the Tomb Raider, the third (and final) part of Lara Croft’s rebooted origin story. The new CGI trailer, aptly named “End of the Beginning”, gave fans a glimpse of what’s to come in Lara’s latest adventure: crumbling Maya ruins, mist-filled tropical jungles, deadly traps, treacherous terrains, ritual human sacrifices, an impending apocalypse, and a Lara who’s beginning to question her actions and their (sometimes dire) consequences. Make no mistake: Shadow of the Tomb Raider looks set to become the darkest, grittiest entry in the reboot series yet. 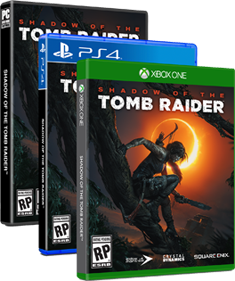 The trailer may not feature any in-game footage but it’s already clear that Tomb Raider fans are in for a real treat when Shadow of the Tomb Raider steps out of the shadows this September. If you want to know more about the season pass and the different editions available for pre-order, check out this handy guide. Visit the official Tomb Raider site to download a fan kit containing wallpapers, social media icons, and concept art and to learn more about the game’s new features and DLC release dates. Please note that any of the details above are subject to change and that new editions may be announced in future.